Type and Use: Annual with edible foliage, flowers, and seed; Very pungent. Location: Full sun to light shade Planting Dates: Sow seed after the weather starts to cool in the late summer or early fall and sow a little more seed every few weeks. Can also be planted in late winter. Planting Method: Sow seed in the fall; thin seedlings to 1 foot. Because of their taproot, they are hard to transplant once established. Harvest Time: Cut the foliage any time, the flowers when they are in bloom. 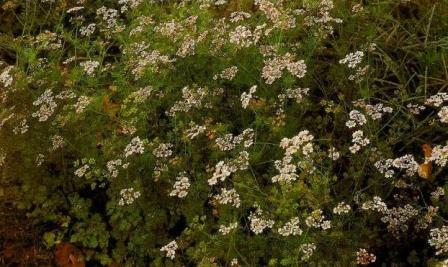 Growth Habits: Lacy herb with white flowers in late spring or early summer. Young foliage is large and flat, the growth is feathery as it matures and starts to form white or mauve flowers. Its pungent fragrance and flowers attract beneficial insects. Culture: Easy to grow from seed. Need healthy, well-drained soil. Hard to transplant. Needs moderate water and fertility. Troubles and Solutions: Weevils may attack seed in storage. Store with bay leaves. Spray with garlic/pepper tea to repel garden flea hoppers. Harvest and Storage: Cut and use the foliage any time. Collect the seed when mature and brown. Store the seed in glass containers with natural diatomaceous earth added as a drying agent. Notes: Also called Chinese parsley and cilantro. Seeds are delicious to eat raw. Foliage is used fresh in salads and with various meat dishes. Roots can be used to flavor curries. Learn more on vegetable gardening the Natural Way. Buy the book at your favorite book store or click here to purchase online. The organic gardening techniques in the book are for gardeners everywhere, not just Texas!